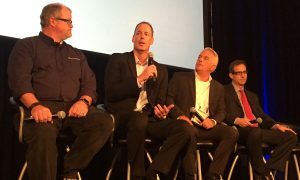 The overarching theme at last month’s RSN Summit was that when it comes down to it, there’s nothing more important or valuable for a regional sports network than its live games. Naturally, those networks want to do as much as they can to capitalize on those games and to serve the fans to their fullest capacity. The most common way to do that? Full fledged studio (or on-site) pre- and post-game shows. During the event, Doug Johnson, VP/Executive Producer at Root Sports/AT&T Sports Networks; Tom Stathakes, SVP Production and Programming at NBC Sports Regional Networks; and Howard Zalkowitz, Director of Production/Senior Coordinating Producer at NESN discussed why pre- and post-game shows receive so much TLC. Pre- and post-game shows each have very distinct goals. One is meant to build to a live event, while the other is meant to retain viewers following that live event. Zalkowitz discusses the inherent challenges in both and shares some of his network’s strategies. Keeping fans on board for the post-game show is an ever-evolving challenge. Johnson and Stathakes dive into their thoughts and strategies behind finding success in post-game. Sports networks are always looking for new ways to engage fans with studio programming. David Hoffman, Sales Engineering Manager for Brainstorm dives into how virtual sets and augmented graphics technology can build a new level of engagement with viewers. To watch this panel discussion in its entirety, CLICK HERE.